America has been in a Mexican standoff for the past year. By that, I mean the U.S. and Mexico faced off in a bitter dispute over the North American Free Trade Agreement (NAFTA). The standoff turned into a showdown. Now that showdown is over. And free trade won! Now, you can win, too. 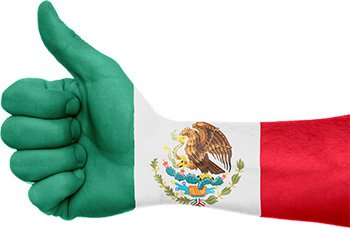 As you probably know, the U.S. and Mexico announced a preliminary trade deal on Monday. President Donald Trump declared victory in his attempt to renegotiate NAFTA. At least, the Mexican part. The new deal includes stricter rules for autos, textiles and other goods. But those are mostly tweaks to existing agreements. It also includes new regulations on intellectual property and digital goods. The fact is, NAFTA isn’t changing that much — just enough for President Trump to say he won. It’s also a good enough deal for Mexico to sign on the dotted line and think it won, too. You can see that the EWW compressed since last August. That’s since President Trump announced he wanted to redraw NAFTA. And no wonder. A guestimate was that revoking NAFTA would hammer Mexico’s economic growth to the tune of at least 2% per year. And the U.S. accounts for half of Mexico’s GDP. Just the fear of NAFTA being fed into a paper shredder weighed on Mexico’s economy. It slowed down, growing only 2% last year after growing 2.9% in 2016. 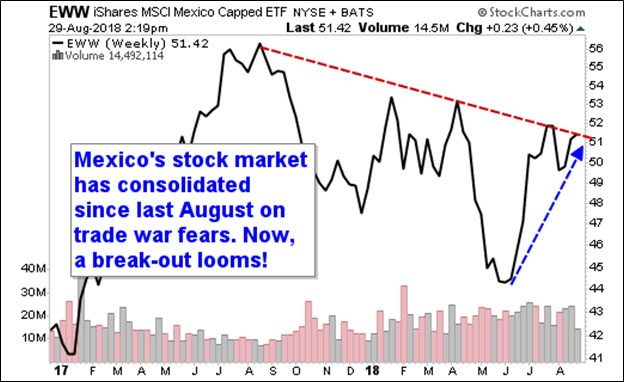 But the Mexico ETF bottomed in June. Then it ramped up on hopes that the standoff would end soon. The EWW is still in a downtrend. But it could break out soon. Once it does, we could see a move to $66 a share. And the U.S. is a winner, too. The main products exported by Mexico to the U.S. are vehicles, machinery and electrical machinery. But those products contain about 40% of materials sourced from the U.S. So, that’s win-win. The standoff is over. This should put pressure on Canada to come to the table. After all, as Mexico showed, if you allow President Trump to declare victory, you can get pretty generous terms. Just do your own due diligence before you buy anything. And don’t drink the water.